The widow of one of Elisha’s followers comes to him for help. Her husband left her with an outstanding debt, Since she has no means to pay off the debt, the creditor demands her two sons become his slaves. Elisha has a plan. He tells her to borrow empty jars from her neighbors, lots of them. Then she is to go home, close the doors, and begin pouring olive oil from her small jar into all the other jars. She does and the oil continues flowing until every jar is full. Then it is gone. She sells the oil. With the proceeds, she pays off her debt and has extra to live on. What if she had borrowed more jars? What if she only borrowed a few? 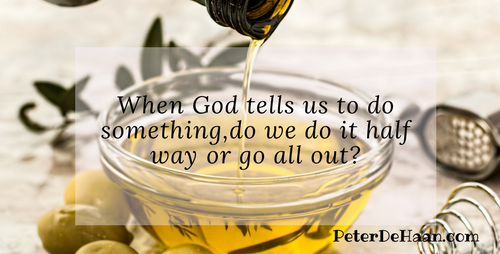 When God tells us to do something, do we do it half way (and possibly miss his bounty) or go all out?